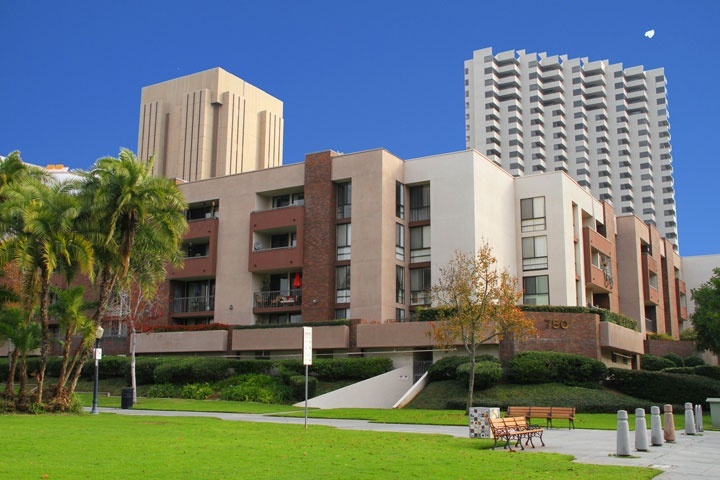 Marina Park condos are located at 750 State & 850 State Street in San Diego. If you are looking for a condo in the downtown Marina District of San Diego then Marina Park maybe the place for you. Marina Park is a smaller four story building with 224 units with homeowners association dues run $483/month for 24 hour security & concierge, two pools, jacuzzi, fitness center and covered guest parking. It's located in the prime Pantoja Park Marina District near the Waterfront and just minutes to Horton Plaza, Gaslmap Quarters and Petco Park. Below are the current Marina Park downtown San Diego condos for sale. If you are looking for a downtown San Diego condo for rent please visit our San Diego rentals page. We also provide all sold Marina Park condo sales at our San Diego Sold Search. We are the Downtown San Diego Real Estate experts. All Marina Park condos for sale are also listed below. Questions? Let our team of San Diego Realtor Associates help you. Please contact us at 1-888-990-7111 today.